Gara Coppola, left, a retired real estate broker, is able to stay in her own home thanks to help from caregiver Diane Snedeker, who is with Seniors Helping Seniors. Retired real estate broker Gara Coppola wanted to grow old in the house she’s shared with her husband, Peter, for the past 21 years. This region has one of the fastest-growing senior populations nationwide. 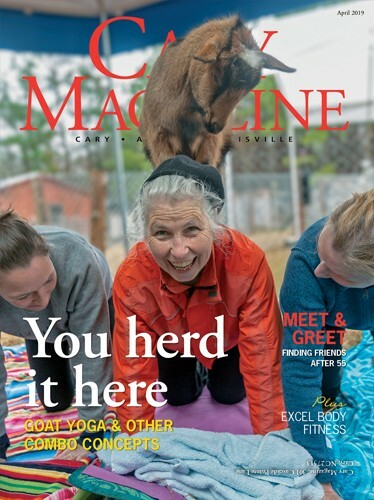 About 10 percent of Cary’s population is over the age of 65. 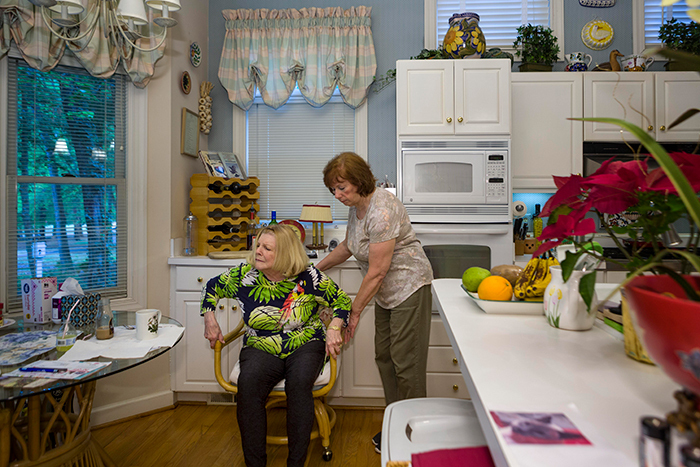 Like the Coppolas, many seniors are choosing to age in place with the help of services geared toward making their golden years comfortable at home. 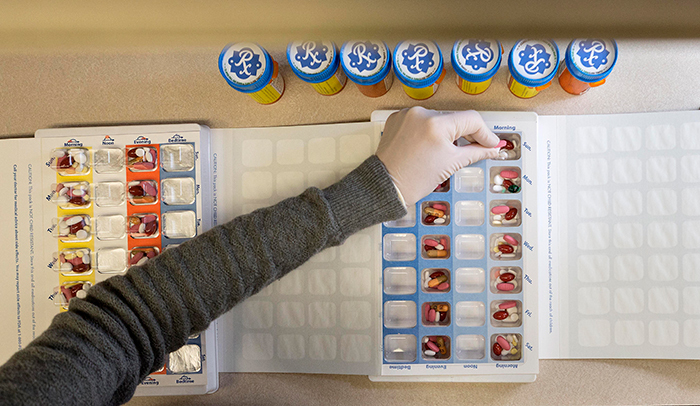 Hayes Barton pharmacy technician Julie Stoner refills a customized multi-dose medication packaging folder, which organizes seniorss’ medications by day of week and time of day. However, there are many factors that can easily change this equation such as one’s state, whether they rent or own their home, or if they require additional services such as Alzheimer’s care. Hahn further explains that the cost comparison between home care and nursing home care is not cut and dried. According to the American Elder Care Research Organization, the general rule of thumb is that if 40 hours or less per week of paid home care is required, then home care is a less expensive option than assisted living. Margo Arrowsmith, a Cary-based aging- in-place consultant at Silvers Linings, a Senior Counseling Service, says the key to keeping parents at home is having a team in place. She penned her book after caring for her mother and father at home. It is a combination of lists, resources and her personal story of caring for her parents — including mistakes made. Her elderly parents initially lived in a guest house on Arrowsmith’s property in Raleigh. After her mother’s death, her father lived in her home. Arrowsmith reflects that she was lucky to share the last moments with her 92-year-old father. “I helped him into bed, and I tucked him in. We hugged and we both said, ‘I love you.’ I came down the next morning, and he was gone,” she recalled. 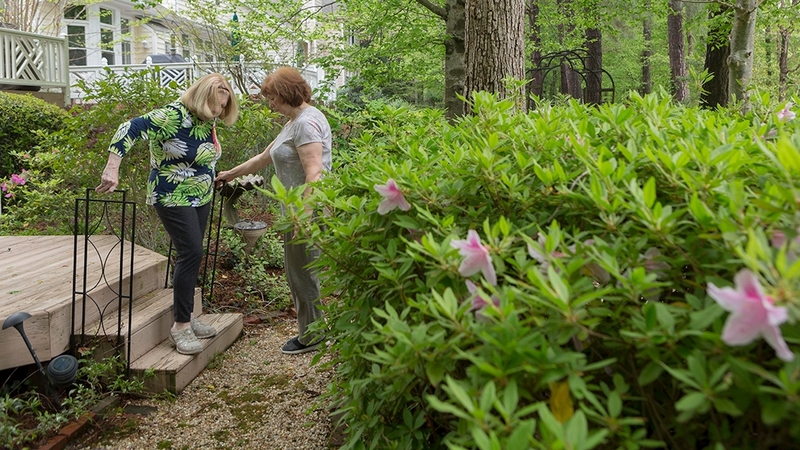 Diane Snedeker, right, helps Gara Coppola with gardening and other chores. “The reason I got started with Seniors Helping Seniors was because I felt the need to give of myself. I’m working, but it’s like being with family,” says Snedeker. In hindsight, Arrowsmith wishes she would have hired someone to handle more chores when her mother was living, because her father was overwhelmed by caring for his wife, who suffered from debilitating diabetes. She could have benefitted from a caregiver from the award-winning Aware Senior Care, which provides in-house care for seniors. 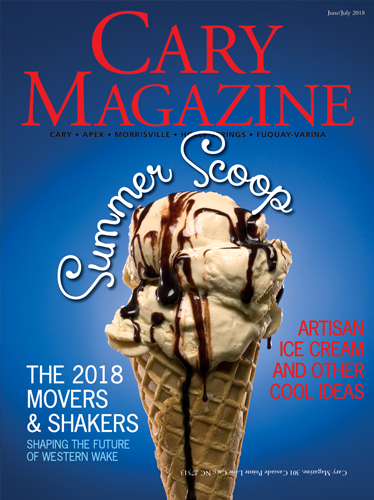 Started by Tim Murray and his wife, Gina, the Cary-based family-run business started out of necessity when the Murrays needed to find quality, compassionate home care services for their aging parents. Gina says the company offers both companion and personal care services. The staff can assist in grocery shopping, meal preparation, laundry, cleaning and transportation. Duties most in demand include the changing of linen. Many seniors struggle to reach the corners of the bed. Others like someone in the home while they are showering. And then there are the rides to doctor’s appointments, church services, luncheons and the beauty shop. Karen Hankins, owner of Integrity Money Management based in Cary, helps seniors manage their daily monetary affairs. The former math teacher and bookkeeper will come to a client’s home, organize and pay their bills. Hankins finds many seniors are overwhelmed by the task of bill-paying, or their now-deceased spouse handled that chore. She makes sure bills are paid on time and also prepares a budget so seniors can see where their money is going. Several times, Hankins has found ways to save her clients money. “I make sure they are utilizing the services they are paying for,” she said. “I had one client paying for internet services she didn’t need. I saved her $50 per month. 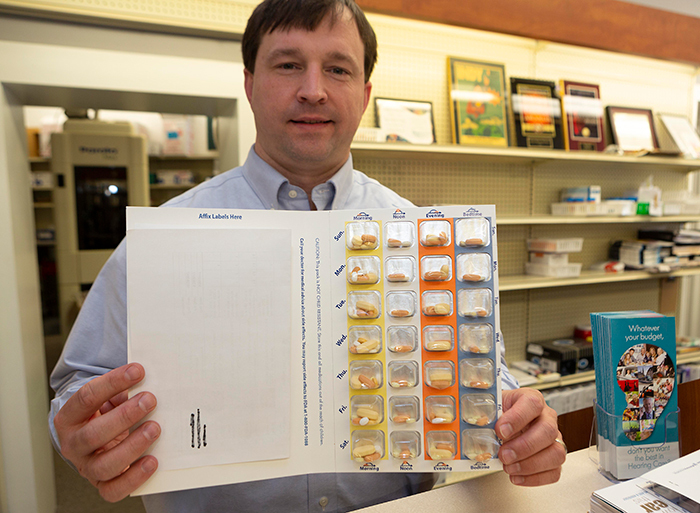 Brent Talley, owner of Hayes Barton Pharmacy in Raleigh, displays a customized multi-dose medication packaging folder. The pharmacy will deliver prescriptions and over-the-counter drugstore items to seniors’ homes. Hayes Barton Pharmacy of Raleigh also helps seniors stay on top of medical issues by offering pre-packaged medications. “We organize them like a pill box. They are customized based on how they are using them,” said Brent Talley, the pharmacy manager. All the morning, lunch, evening and bedtime pills are synced. Each card has pills for seven days, and patients are given a four-week cycle. “When they get to the last card, we call them and talk to them about medications to see if there have been any changes,” he said. The service costs $20 per month for syncing medications and prepackaging. The first three months of service is free with a $10 minimum of prescriptions. The pharmacy serves those living in most parts of Cary and will also deliver over-the-counter products such as toothpaste or lotion. Hayes Barton Pharmacy delivers to most Cary residents except those in southwest Cary. Eric Oltman, owner of Seniors Helping Seniors Jordan Lake In-Home Care Services, hires people in their 50s and 60s to help clients in their 70s and 80s living in Cary. His caregivers range from retired nurses to former business owners. Diane Snedeker, 67, is a retired housekeeper for an assisted living facility who now works for Seniors Helping Seniors. She assists Coppola, who suffers from Parkinson’s disease, with gardening and other chores. “Last week, we spray-painted a planter and planted lavender, rosemary, basil, oregano and cilantro. She loves nature,” Snedeker said. Meanwhile Coppola and her husband get to enjoy the gorgeous view of the golf course from their backyard and their hot pink azaleas. I am interested in this book … HOME SAFE HOME. Where do I purchase it?